By Kilian recently launched its Asian Tales perfume collection; the debut fragrances, Bamboo Harmony and Water Calligraphy, were developed by perfumer Calice Becker, who used iconic symbols of Asian art and culture as inspiration — bamboo/tea and calligraphy/water lily (why not lotus, Ms Becker?) I was looking forward to this new collection and hoping it was truly an ‘Asian-infused’ line and not a line geared toward Asian consumers (who, we are told by marketers, prefer modern, super-light, non-perfume perfumes). Water Calligraphy begins with sweet citrus and mignonette (fleeting, alas); within seconds of application, a water lily-jasmine-magnolia accord appears (accent on sheer, sugary jasmine). In the quickly arriving heart of the fragrance, Water Calligraphy piles on the aquatics and it reminds me of Issey Miyake L’Eau d’Issey (all those fresh, watery floral notes). Water Calligraphy is all about clear, clean aquatic notes mixing with white florals (to me, this scent could have used a few drops of pungent black ink aroma to offset the unrelenting “fresh” and “sweet” elements). Water Calligraphy smells very “mainstream” (but with higher-quality ingredients); it would not be out of place on any department store perfume counter. Bamboo Harmony starts with a bigarade-neroli accord (a “warm” not “cool” take on these notes). Quickly, the scent of white tea appears and the perfume softens to a powdery sheen. I detect maté too (slightly smoky and rich), but here, it’s in the background (though in mid-development Bamboo Harmony smells like a quieter, more natural Tea by Comme des Garçons). As the maté begins to disappear, Bamboo Harmony fades (I don’t detect fig or oak moss on my skin); it wears down to a vague ‘spicy-floral’ scent. Bamboo Harmony is a pleasant, rather casual-smelling tea fragrance, and doesn’t possess even a hint of bamboo’s vegetal/raw wood aromas. There is one interesting element in Bamboo Harmony: a chalky floral note (talc-y, dry, even a bit “severe”) that conjures chrysanthemums; unfortunately this note is not diffusive…you must put your nose to skin to smell it (if it were the dominant element of Bamboo Harmony I’d like the fragrance more). Chrysanthemums are a potent symbol in East Asia, so I’m hoping this note will appear in a future Asian Tales perfume. I love the aromas of Chinese and Japanese teas; Asian incense; vegetal bamboo; water lily; lotus; chrysanthemum; simmering rice; yuzu; Buddha’s hand citrus, but, so far, By Kilian’s Asian Tales perfumes don’t smell “Asian” at all (marketing trumps content). 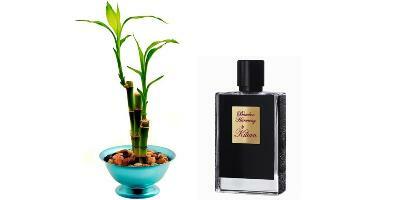 As with many By Kilian perfumes, Bamboo Harmony and Water Calligraphy are sweet, smooth and clean concoctions; the word that comes to mind to describe them is “nice” (neither Bamboo Harmony nor Water Calligraphy can be accused of being ‘interesting’). Bamboo Harmony and Water Calligraphy have good lasting power and so-so sillage. Though they are marketed as unisex, they smell feminine to me. Bamboo Harmony and Water Calligraphy Eaux de Parfum are 50 ml/$225; for buying information see the listing for By Kilian under Perfume Houses. Note: top left image via Wikimedia Commons. They recently appeared in the online range of my favourite niche perfume boutique in Poland. Wanted to try it when I was visiting the boutique few weeks ago but they didn’t have them there yet. I have only tried on By Kilian perfume – Prelude to Love which I really like. Sure I’m willing to try others in future, but those two Asian Tales didn’t make me particularly excited. I’m curious about some other Kilian (and not only Kilian) scents more. L:I really liked the recent Amber Oud in the line. BK’s Noir and Arabian lines are much more interesting. Eau D’Italie’s Au Lac is similar to the Water Calligraphy but at a lower price. Bamboo Harmony, for some reason, smells to me like a poor copy of Dior’s Escale a Pondichery. Did anyone else get this? I’ve been meaning to write something about it. It’s OK, but I’ll stick with Pondichery – more tea oomph, and jasmine. The other reference for Bamboo Harmony, as Ari at Scents of Self pointed out, is Bath and Body Works White Tea and Ginger. Water Calligraphy I thought was horrid, and I’m not opposed to aquatics on principle or anything. Sorry, Kilian, but these two seem like cash-ins to me. I would never pay Kilian prices for these. I received samples of both these scents. I found them both boring ! Mitsouko: I think there are three more Asian Tales on the way…keeping my fingers crossed. Yes, Kevin. I really love the By Kilian line- so rich and baroque and then ..this … I really could not muster up any words at all to describe them on Basenotes , so I gave up and gave my samples away. Yes, we want black tea ! Also ,please some peach …but that’s just me…..
Mitsouko: peach is good..osmanthus too! Me too! I got samples from Luckyscent and I’d heard good things about By Kilian. But these two just bored me to tears. Not bad, by any means, but just not interesting in the least. Akimon: I didn’t have that problem at all…and I drench myself with perfumes I’m testing. Well, I love a good tea scent, but thankfully, these do not sound like they will foot the bill (and therefore, neither will I!). MR: I love tea scents too…bring on the BLACK tea, please! Enough of this “white” stuff. Or we could vainly wish after an earthy/dirty, slightly smoky, boozily fermented pu-erh based perfme. That might actually be a new tea for perfumery to play with. At least I don’t think I’ve seen a pu-erh note listed, ever. KR: tea is such a great category, isn’t it? I’d love a great citrus oolong this summer…. Oh, that sounds nice! I’d love a sort of “iced tea” refreshing summer tea scent. And, actually, love mate tea and would welcome that sort of hay-and-dust feel that mate could bring. I finally used up my bottle of Bvlgari The Vert. Any suggestions on a replacement, (or any comments on whether BVLGARI has reformulated)? I feel bad about saying this, since they so nicely and frequently mail me free samples, but absolutely nothing in this line has grabbed me, and these two were exceptionally boring. Dominika: it happens…often. An entire line will just not be your cuppa tea so to speak. The one I’d consider buying in this line is almost $400…so it won’t happen! Ockeghem: ha! I remember the days when I wouldnt go much beyond $100! LOOONG time ago! I was also disappointed with the new Kilians for that price. I usually buy Kilian refills and decant them into a small spray bottle to save money. I have a few Kilian scents from the Love line (Prelude to Love, Love, Beyond Love). I tend to prefer the white flower scents and think their tuberose scent smells very pure and lacks that synthetic, plasticky vibe that other tuberose scents have. Today, I need some expert help!! I am in dire need of a scent “hit” right now and am combing the net looking for a new scent. What suggestions do you have for me? I do fruity florals, florals, musks, and an occasional warm vanilla scent. I already have Botrytis, Narsciso Rodriguez (Black), Monyette, the Kilian Love line, Kai, Keiko Mecheri Peau de Peche, Keiko Mecheri Loukoum (mistake! ), Hermes Eau de Merveilles, and L’eau J’Adore. I usually buy from Luckyscent and was wondering if Indiescents.com had anything of worth. I’d like to spend less than $150. BTW, patchouli makes me sick and I don’t like marine notes, or blackberry. Shelli: I’m curious about the new Nicolai — l’eau “folie”; Robin reviewed it last week. I need a ‘hit’ too! Ha! I was amazed by water calligraphy, in a bad way. Its resemblance to cheap men’s cologne in the 90s was shocking. Like a male sports deodorant smell. Chemical and faux clean. Maybe calice becker’s idea was to take this dated, lowbrow note and make something luxurious out of it? It didn’t work. For me anyway! Hi, Kevin, I’m sorry to hear that these perfumes cater more to the “market” than the aesthetics. But the olfactory truth is that here in Asia, people try to blend in out of habit, and perfume-wearing is not encouraged at all. Most of my friends react badly to perfumes, and I know nobody who wears or appreciates any. Living in Singapore, I have a gorgeous bottle of Annick Goutal’s Songes that I very rarely use. It’s sad, and I do wonder whether the community as a whole will change their perception regarding olfactory aesthetics.